I’m not much of an events person. I’ve said it before and I’ll say it again – nothing, and I mean nothing, is lower on my to-do list than putting on a tuxedo (or anything with a tie) and going out for a fundraising event. I do it, but only when my paycheck depends on it! That being said, I saw this post and wanted to highlight it simply to say THANK YOU to the good folks at Vivanista. 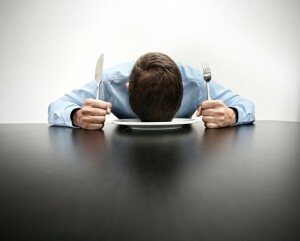 Their post on ‘Creating the Perfect Menu‘ touched me personally. #5: . . . . put all condiments on the side. . . .
Hallelujah! Need I say more? Being stuck at a long fundraising dinner (or catered lunch meeting) is one thing. Leaving hungry is another. From those of us who hate certain condiments, thank you Vivanista! You’re making the world a better place! I’ve been in a bit of a funk at work lately. . . not the kind where you update your resume and start shotgunning it to every open position in the Chronicle, but the kind where a bunch of never-ending projects have started to get the best of me. In my mind, nothing is worse than working on multiple projects that are so big they seem to have no end in sight! My usual advice to folks in this situation is to get out and see the results of the good work they do. In my business, that means heading to campus to see students or tour a new lab or building. For others, it may mean taking an afternoon away from the fundraising grind to work the front lines distributing services to those in need. Few things are more rejuvenating than seeing the actual fruits of your fundraising labor. Last week, a little kick in the pants sought me out. I happened to attend an event that featured a happy graduate talking to a group of students. I had no idea the event would be so powerful. Turns out, this gentleman took the opportunity to tell a detailed story about his philanthropic journey. We had asked him to make a reference to giving in his remarks, but he delivered so much more. By the end, everyone in the room was in tears and he challenged each and every student to support the university in the future. This was no subtle challenge, and it came from a man who obviously understands that every gift makes a difference. The atmosphere was perfect and I know the young men and women in that room will remember his story and challenge when they are asked to give in the future. Few things are more powerful than a passionate story from an invested donor. All the well-written collateral materials, videos and Facebook pages in the world can’t reproduce that single storytelling moment when somebody who ‘gets it’ tells their tale. It’s truly inspirational. Thank you, sir, for telling your story. Your words were perfect for that student audience. And for the rest of us as well! As many of you know, we are entering college basketball’s biggest weekend, and the NCAA Champion will be crowned Monday night. Given the circumstances, it seems like the perfect time to announce Volunteer of the Year award! 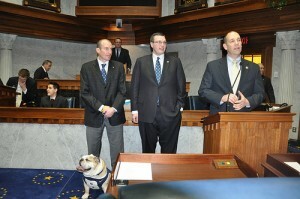 The 2011 GettingGiving Nonprofit Volunteer of the Year award goes to: Butler Blue, II. Huh? How, you might ask, can a dog win such a prestigious award? The answer is simple: this ain’t your ordinary dog. 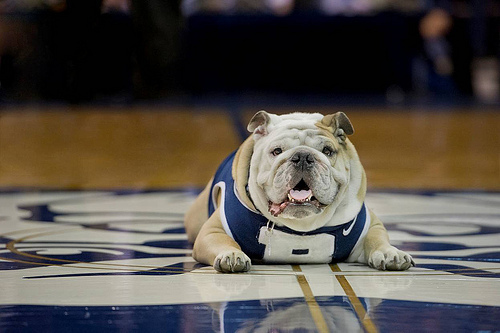 It’s Butler Blue the Second, the official mascot of Butler University. Like many other volunteers, he learned his love for Butler from hearing stories of his predecessor, Blue 1. He’s a legacy, and his tireless efforts have helped Butler University in numerous ways just like Blue the First. He works hard during the NCAA tournament, but it doesn’t end there. He volunteers throughout the year. He works with students, alumni, donors, the media and more. If all of our volunteers worked as hard as Blue to spread the word about the good work our organizations do, we’d be set. Boy, does he spread the word! He’s all about engagement, and his efforts help others understand the exciting things happening at Butler. He shares stories about what’s happening in the classroom, at events and activities, with the student population and, yes, on the court. Turn on the television, and you’ll find Blue. Open a newspaper, there he is again! On the radio, in magazine interviews, in advertisements – nothing is beyond Blue’s reach. When current and prospective donors come to campus, it’s not unusual for Blue to be summoned to say hello and pose for a photo or two. He loves their generous support and they love him! The same goes for numerous campus events. From homecoming to gala dinners to the annual Senior Gift kickoff, Blue is always first to volunteer to attend and share the Butler Way with others. He’s a great volunteer, quick to say yes but always following the staff’s lead on where and how he can make the biggest impact. But where Blue really shines is social media. His Facebook page has more than 3,800 likes. He maintains a Blue Blog. He has a robust Blue Youtube (BlueTube?) channel. He has a flicker photostream and live webcam. 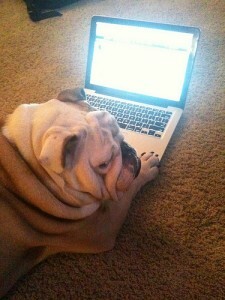 And, of course, he is @ButlerBlue2 on Twitter with nearly 4,500 followers. Blue is quiet in his TV and radio interviews, but put those paws on a keyboard and he’s got greyhound speed in that squat little body. To say he tweets a lot would be an understatement! He maintains an ongoing rapport with fans, local celebrities, media personalities and more. Each of these social media outlets is used to share the good news from his favorite organization, Butler University. Blue maintains a comprehensive, entertaining and constantly updated social media empire. And that’s why he’s the 2011 GettingGiving Volunteer of the Year! I first met Blue several years ago when his human father, Michael Kaltenmark, was a client. Kaltenmark is Blue’s father, owner, and primary manager/volunteer liaison in the development office. He was Director of Annual Giving at the time and Blue, just a pup, would nap quietly (or not so quietly) in the corner when we would meet. I had the sneaky suspicion Blue didn’t like me much, as my alma mater isn’t one of his favorites. We Tweet at each other occasionally on this topic, and Blue doesn’t hold back, as he’s loyal only to the Bulldogs of Butler! Kaltenmark serves as Blue’s translator and spokesperson when necessary. Both Blue and Kaltenmark were unavailable to comment on their award, as they are traveling to Houston, Texas for the NCAA Championships this weekend. While the VOY award is well deserved, Blue does not come without challenges. Like any volunteer, the relationship must be cultivated over time, and there can be disagreements and issues to resolve. Blue likes to sleep. He’s not a morning person, and when an early meeting or event is necessary, he can be a bit grumpy. The advancement team knows this and works to accommodate his schedule as best they can. Sometimes, however, duty calls. Blue can be opinionated. He had days when he doesn’t listen well, and has a mind of his own. The advancement staff works with him to explain why it’s important to ‘go potty’ outside rather than in their offices, why he can’t chew on the stapler, etc. He may disagree but they need to set some rules, even though he’s a valued volunteer. He’s a volunteer, so he’s not getting paid. But he, like other volunteers, likes to be wined and dined occasionally. Luckily he doesn’t break the budget at the open bar (he prefers cold water to premium spirits) but he LOVES those hors d’oeuvres! The events team knows in advance to order extra when he’s coming to the event. Especially those little hot dog things! He can be high maintenance. Seems a staffer needs to be around at all times to tend to his needs. He likes his trinkets and sportswear, always requesting the latest t-shirt with his photo on it. His own collar, his own fathead, his own varsity letter jacket, food bowls with his photo on it, and even his own custom ring from the NCAA Final Four last year. He’s already said he wants a championship ring this year. Geeze, greedy! Like some other volunteers, Blue is a bit shy when it come to making a direct ask for support. Blue might be asked to leverage his vast social media empire a bit more to ask others to support Butler. A few tweets each year leading his loyal followers to the Butler online giving page wouldn’t be asking too much, would it? Finally, he likes the ladies. He’s always taking pictures with young undergrads and cheerleaders. He’s a bit of a hound dog, and at the age of 42 in human years, those young ladies aren’t as interested as they used to be. They do give him a lot of attention and scratch his ears, but the staff knows to watch over him so he doesn’t get too friendly and overstep his boundaries. I hope you’ll join me and congratulate Blue on winning this big award. Below you’ll find a recent television story about Blue and this week’s other big accomplishment of having a martini named after him. A few photos are also included. Good luck at the big dance and enjoy your weekend in the spotlight, Blue! 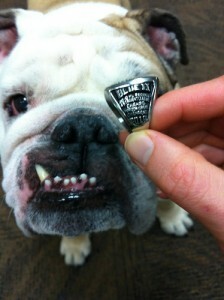 The 2011 GettingGiving Volunteer of the Year Award, a martini, and a Final Four – what more could a bulldog want!?!?! 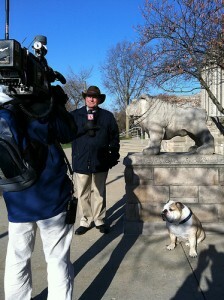 Blue representing Butler at yet another TV interview. Blue was presented with an NCAA ring for his support of the team. Blue likes the ladies. Maybe too much. The Getting Giving Blog is a collection of ideas, commentary and occasional rants about the fundraising profession and related topics. Consisting of both original and linked content, Getting Giving strives to provide its audience with information to provoke thought, new ideas and increased effectiveness. Jeff Lindauer (that's me) has nearly twenty years of experience in the profession and is currently associate vice president for development at a large university foundation. Additionally, he provides counsel to a variety of organizations on a part-time basis while juggling life with two young children. The views expressed in this blog are solely those of the author, and do not necessarily represent those of his employer, clients, family, friends or anyone else.